During the early 1880s Grimshaw's production increased dramatically and he sought new subjects in urban centres and dock scenes. Most of these works were night scenes, enabling Grimshaw to transform a subject familiar enough by day into a place of mystery, or even poetry. Grimshaw's paintings of the 1880s have a much greater breadth as he sought to accommodate the possibilities of river and city life. It was recognised by his contemporaries that these moonlit views were not just topographical but fitted in with the literary mood of the times, turning what was potentially squalid into art. 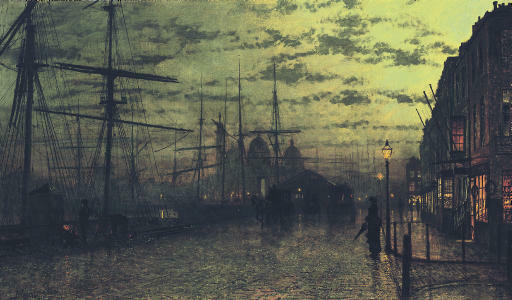 David Bromfield describes Grimshaw's port scenes as 'icons of commerce and the city. They are remarkable in that they record the contemporary port's role within Victorian life; they appealed directly to Victorian pride and energy. They also show that same darkness, a mysterious lack of complete experience of the subject which one associates with large cities and big businesses, which Dickens recounts so well in Bleak House and Great Expectations and for which Grimshaw's moonlight became a perfect metaphor' (Atkinson Grimshaw 1863-1893, exh. Leeds, Southampton and Liverpool, 1979-80, cat. p. 15).